Spring is coming and I can't wait! As we transition into spring I have a list of small and large projects that I want to tackle. My first project is a small one. 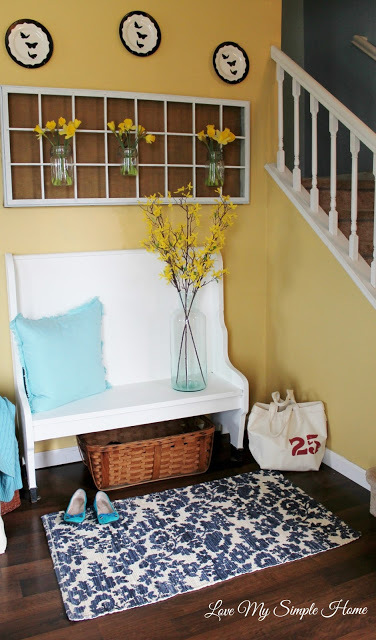 It is a refresh of our tiny entryway. I painted the deacon bench white and placed it in this spot near the staircase and our front door. I love the color white, it is clean, fresh, bright and goes with every color of the rainbow. After going through countless paint samples, I decided on Simply White by Benjamin Moore. Deacon bench before the FIRST makeover. Here is the space I am working with. I purchased a paint sample of Simply White at the hardware store. I used a nylon paint brush and applied two coats of paint. While the paint was still wet I used a foam brush to smooth out the lines from the paint strokes. I used a foam brush to apply a very thin coat of paint mixed with a splash of water. After the paint dried I put everything in place and started to decorate. Fresh cut daffodils in mason jars hang from the wall vase. Plates are an inexpensive way to decorate. Simply install plate wall hangers and hang in groups. These three black and white butterfly plates add instant style to space above the wall vase. An area rug offers a soft place to put shoes on. Our sweet Molly girl always ready for a photo opp. Simply White is the perfect refresh for spring! 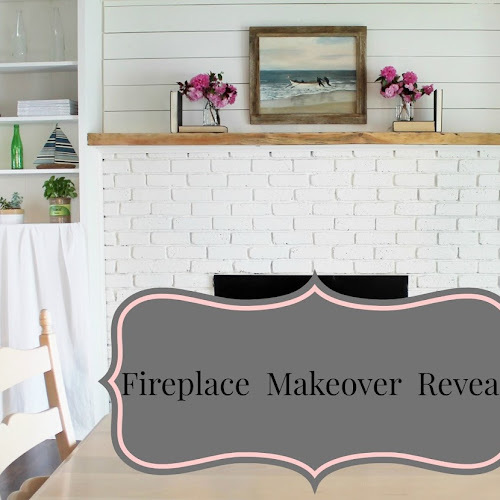 Are you thinking of a spring refresh with white paint? Oh my... your bench is so stunning! And I'm so smitten over your window.... that is beautiful! Trying to think where I could add one! p.s. Julie, you may want to try reloading your link code so the pictures show up. Thank you Donna for the visit. I'll reload the code again.I hope the pictures show this time. I love the bench and the little area it is in! So cozy and welcoming! Such a bright cozy space--love it! I love how your bench came out -- it's so sweet and cute! Visiting from the #DIYMySpring blog hop! Thank you Cindy for stopping by!! I love that bench! And the crisp white looks amazing. Beautiful! Welcome spring! Thank you Karen! So nice to have to stop by for a visit! Such a pretty and fresh area. I love the spring colors in your home. White and yellow are such a great combination! Thanks so much Michele for the visit! What a great transformation for spring. This post was truly a joy to read and I hope that you will continue adding your ray of sunshine every week on Thoughts of Home on Thursdays.